I grew up with video games. I still remember owning a Colecovision and hours spent in arcades in high school. My love for video games still exists even though the types of games I play has changed. Wreck-It Ralph manages to pull in kids with the story and their parents with the nostalgia of their own childhoods. 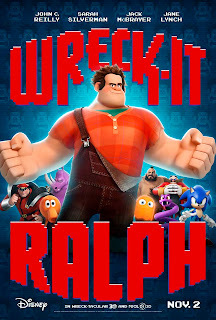 In the latest from Disney/Pixar we get the story of Ralph (John C. Reilly) the villain in the game Fix-It Felix Jr. His video game is 30 years old and he feels slighted for being a bad guy, while Felix is treated wonderfully after the arcade closes by the other inhabitants of his game. One of the ghosts from Pac-Man hosts a VA support group for various villains of other games. Ralph never attended till recently when he started feeling like he could be more than a bad guy. Everyone says stay the status quo. The characters all move from game to game after hours, the bar everyone drinks at is the game Tappers, the Villain support group is into the ghost home of Pac-Man, its just fine after hours but everyone is expected to not game jump while the arcade is open because if your missing or in the wrong place your game could be put out of order and even worse unplugged. Also if you die outside your game you don't regenerate. Ralph wants to be a hero so badly he game jumps into Hero's Duty, a first person shooter game similar to Halo. He meets up with Sargent Calhoun (Jane Lynch) then accidentally gets blasted out of the game with a virus and ends up in the racing game Sugar Rush where he meets Vanellope von Schweetz (Sarah Silverman) a glitch in her game. She wants to be a racer like everyone else but she's an outcast because of her glitch. A side effect is that glitches can never leave their games. If your game gets unplugged you can leave and end up in Game Central Station which is where we see Q*bert and his game cohorts as homeless people. The rest of the movie is about the growing friendship between Ralph and Vanellope, as well as between Calhoun and Felix Jr (Jack McBrayer) as they attempt to find Ralph and the rouge virus bug from Hero's Duty. There's some great voice casting in this film. Dennis Haysbert, Ed O'Neill, Edie McClurg, Adam Tudyk and Adam Corolla are all in this. The games you love from being a kid, Sonic, Ryu from Street Fighter, Bowser, and the universal contra cheat is in this movie. There's even a Cola and Mentos mountain. I laughed hysterically throughout this movie and there were clearly game references that only the over 30 crowd would get. C1 thoroughly enjoyed it as well. There were several moments during the movie where she was gasping because she was shocked at the turn of events. Thanks to Super Smash Brothers she recognized several characters but asked me questions about others after the movie was over. I give this movie a Full Price but pass on the 3-D. Pixar knows how to appeal to the kids and the parents who have to bring them along and they deliver as usual here. C1 gave this movie a “purchase” which on her scale means amazing and we need to own it too. The Pixar short before the film is Paperman which I saw previously before watching The Odd Life ofTimothy Green. Its still a cute short and I enjoyed it just as much the 2nd time around. 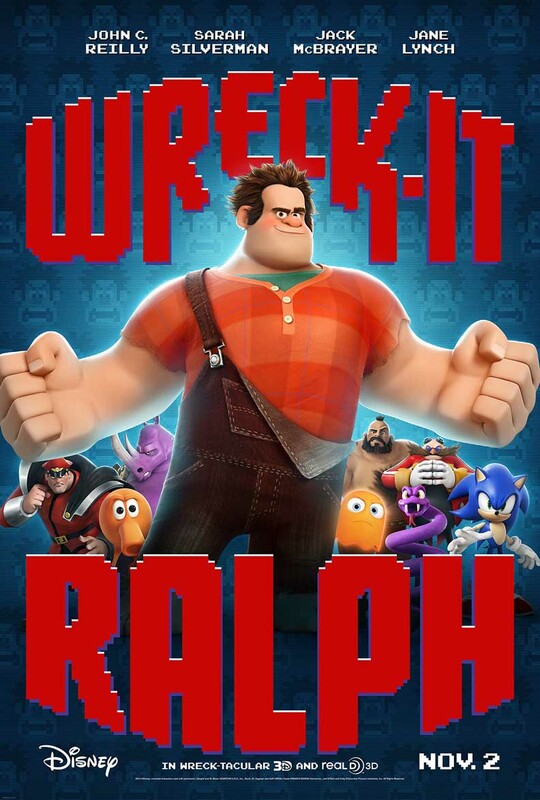 Wreck-it Ralph is rated PG.